Unedited version of an article that originally appeared under the title "Is Obama's Iran Deal a 'Dhimmi' Contract?" IRGC Commander Ali Fadavi's recent threat to "drown American vessels" in the Persian Gulf is only the latest indication that America's relationship with Iran resembles a dhimma contract more than a traditional foreign policy. Since the seventh century, everyone defeated by Islamic conquest was given three choices: conversion, death, or a dhimma contract, which Bat Ye'or calls the "treaty of submission for people conquered by jihad." By accepting the third choice, they became dhimmis – members of a "protected" class whose failure to submit to Allah was replaced by a compulsory submission to Muslims. Isolated and disarmed, insulted at every turn, and coerced into acknowledging their inferiority with regular self-abasement, dhimmis were expected to show humility and gratitude for their protectors. The president's approach to the Muslim world in general has been replete with gratitude, flattery, and apologies – especially for violence perpetrated by Christians a thousand years ago. He refuses to utter the words "Islamist terrorism" and wildly exaggerates Islam's role in "saving" Western culture. At the UN he demanded that "the future must not belong to those who slander the prophet of Islam." He even put one filmmaker in jail for doing so. Obama's approach to the Muslim world has been replete with gratitude, flattery, and apologies. But above all, throughout his presidency Obama has reached out to Iran, publically and in secret letters. His overtures may not be consciously designed to recapitulate a dhimmi's accommodation to his master, but Ali Khamenei treats them as such, offering only contempt in return for the president's obsequious deference. Khamenei leads cheers of "Death to America," and Obama makes excuses for it. Obama insists that Iran's path forward is at the UN with the P5+1 partners, but Khamenei counters that "those who say the future is in negotiations, not in missiles, are...ignorant." Each unanswered Iranian provocation reinforces the image of a dhimmi paying tribute and enduring his proscribed submission with gestures of obeisance. Since 2009 Iran has attempted an assassination in Washington, D.C., shipped arms to Palestinian terrorists in Gaza and Houthi rebels in Yemen, and attempted to hack a dam in New York and the electrical grid in California. The administration has responded with self-effacing conciliation. Even the film of captured American sailors humiliated by the IRGC didn't rouse the president from his supine repose. John Kerry actually thanked "the Iranian authorities for their cooperation." And what of Iran's violations of sanctions, growing more flagrant with each passing year without consequences? Traditionally, the weaker side in such a conflict might deny it had conducted missile tests or pretend that its ICBM program is actually a space program. An emboldened, confident Iran, however, acts as though it has the upper hand and America is its dhimmi. Dhimmis were forced to pay an annual tax called the jizya, originating in the Koran's commandment: "Fight those who believe not in Allah...until they pay the jizya with willing submission, and feel themselves subdued" (9:29). 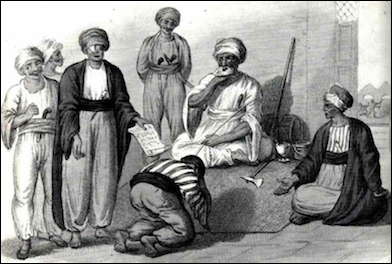 Among the humiliations dhimmis were forced to endure at the hands of Muslims was an annual tax called the jizya, originating in the Koran's commandment: "Fight those who believe not in Allah...until they pay the Jizya with willing submission, and feel themselves subdued" (9:29). As they made their payment, dhimmis were often required to prostrate themselves and accept slaps to the head and neck, symbolic of the fate they avoided with the treaty. In 1799 British historian William Eton referred to the jizya as a "capitation tax" permitting dhimmis to "wear their heads" for another year. The $100-150 billion Iran receives in under the US-brokered Joint Comprehensive Plan of Action (JCPOA) is surely the largest jizya payment in history. Last July as the White House celebrated the JCPOA, Khamenei tweeted an image of Obama holding a gun to his own head. Six months later the IRGC fired missiles dangerously close to the USS Harry S. Truman. In spite of Iran's defiant and aggressive behavior, the president continues to grant concessions, pushing for Iran's access to the US monetary system and even buying Iranian nuclear waste. 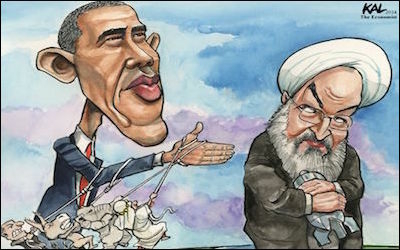 In turn, Iran threatens to close the Strait of Hormuz and kill Americans found there. Shortly after the American Revolution, the Barbary Pirates of Morocco, Tunis, Algiers, and Tripoli began seizing US merchant vessels and demanding ransom. They explained that the Koran gave them the "right and duty to make war" on non-Muslims. But George Washington didn't pay tribute to the sheikhs. Instead he ordered the creation of the US Navy to fight what he called the "nests of banditti." In 1815 James Madison used that Navy to defeat the Barbary sheikhs at sea and on "the shores of Tripoli." Two hundred years later, the Obama administration is taking the opposite approach with the banditti in Tehran, bending over backwards to accommodate the mullahs and lying to the American people about it. In his relationship with Iran's supreme leader, President Obama has assumed the role of a meek and humbled dhimmi paying tribute to a Muslim protector while respectfully enduring his insults. Washington and Madison would be embarrassed.